Can you show me the photo of the rat, V asked. Bangalore is a great city for rats, he remarked – it’s almost like the city is designed for them! It didn’t seem the best topic for conversation in a restaurant, but by now I had got quite immune to such stuff. Once you work in muck, talking about it is easy. X went on – The place we fixed is Rat Heaven. Let me tell you why. He took out a pencil and started sketching. Do you have any idea what lies beneath the footpath? He began explaining. Here’s the drain to take away rain water – it’s called a storm water drain, or commonly known as the gutter. This is not the sewage or drinking water line. Those are separate pipes (at least they are supposed to be! ), and they run parallel to this drain, and at times they intersect. Then we have the underground power lines carrying high voltage electricity criss-crossing this path. All these pipes and cables snake under the road and footpath, and they are great fun for rats to slither on, and swim along. These pipes and cables follow the roads, and the problem arises when there are junctions or road intersections. This Spot happens to be a major junction (where Church Street and Rest House Road intersect)– and the Electricity people have their big Junction Box/transformer located at this junction. So while this is a great playzone for rats, there is only one problem – there is no food! Luckily for the rats, that problem is solved by the BBMP (the city’s garbage collection authority). I had learnt about seeing ‘the other point of view’ to better understand a problem, but seeing the city’s civic issues from the perspective of a rat was intriguing, to say the least. The BBMP solved the rat’s food problem – hilarious! X went on – BBMP, the garbage collection authority has made this corner an unofficial garbage pickup point. It used to be dustbin point earlier – now the dustbin is gone, but the ‘point’ remains. The city planners, in their wisdom, have left no place for transit garbage storage while banning dustbins and dumpsters, so the garbage folks seek orphan spots like this, where they can dump garbage and their Lorry can park to pick it up. It’s not really the fault of the garbage workers, they have no other option. This is not new in Bangalore – in fact it is the norm – almost every major street corner has a transformer and it doubles up as an (illegal) garbage dump. If we ever meet with the authorities at the electricity authority BESCOM, we will tell them that they are Bangalore’s dustbin providers in addition to electricity providers – seeing how their assets are blatantly abused by the BBMP as a garbage transit storage point. What a crazy city – where we use high-voltage transformers as dustbins, and it is considered normal! So, as far as the rats are concerned, the rules are simple. If they follow the power lines, they get the food. And if they get really hungry, they gnaw on the power cables and cause outages. Sometimes they gnaw too hard and reach the real Rat Heaven in the sky, but we suspect baby rats are trained not to gnaw too deep! Garbage beneath footpath drains makes it an ideal place for rats to live. If there’s a transformer nearby, it turns out a heaven for rats! He went on – As this is a junction point, the water and sewerage utilities have their manholes here too. So the rats get a choice of fresh water or sewage water to wash down their food! And after the telecom revolution, a new animal entered this mix – the telecom companies with their optical fibre cables. They have wired up the city by somehow squeezing their cables in this underground mess. In short – all agencies who provide basic services have their critical assets at this corner – most of which lie under the road or footpath. I was stunned. But wait a minute – so is it possible that my broadband cable that brings my internet home is going through my sewage pipe? Well – that is probably better than if it went through my drinking water, I thought. You don’t want to know what goes on down there, X continued. But unfortunately what goes on down there directly affects us up here. And this is why. At any given time, any of these agencies is going down there to repair or replace something, and they often leave the job unfinished. They have no idea what the other cables and pipes are, and often end up damaging the others’ pipes unwittingly. So if the sewage guy has gone down there to unclog a blocked pipe you may well lose your broadband connection. Or the other way around. Needless to say these agencies don’t like each other, and there are whispers that they sabotage each others’ assets too! When it comes to telecom, you have competing providers using the same space, and so all kinds of things go on underground! X ended triumphantly: If you had to pinpoint one single problem that was the root cause of most of the city’s problems, it was this – the agencies that dug up the road and the agencies who had to repair the road and footpath never co-ordinated their activities and are always blaming the other- and the road remains dug up for months or years. This was cool, I thought – X was able to focus the cause of our civic issues down to one thing. This seemed to be a logical way of approaching a problem – trying to pinpoint the crucial underlying issue. X added – The long-term solution, of course, is to have ducts beneath the footpath to carry cables, and rejig the entire sewage and drain system to ensure the road never needs to be dug up to access these underground cables and channels. But those are big, expensive infrastructure changes – and god alone knows when that will happen. Till that happens, some sort of solution needs to be found. V chipped in – Now let me tell you one more thing. The sewage lines here are really small – designed for the 1940s when there were a few homes and a couple of restaurants. Now there are hundreds of homes, businesses and restaurants – but we still have the same British-era sewage lines! It is incredible. No wonder the sewage line gets choked everyday – with forks, knives, food all kinds of stuff. So you call these guys to clean it and unclog it, else there is a backflow and….ok never mind! Just come here at lunch time on a working day and you will see what I mean. At least V seemed a bit sensitive about not discussing raw sewage over a meal! This whole business seems like a racket, V continued. These guys get paid handsomely everyday to unclog sewers, and there seems to be no incentive to lay a bigger sewage line. Otherwise it is hard to explain why this basic infrastructure has not been fixed. In our Times of India Spot, the fact that the road was dug up for cabling and a manhole was unclogged exactly where the garbage point was, led to a heady cocktail – a dug up road, debris lying about, and garbage everywhere. (Reader discretion advised to read further). Garbage had crept into the craters in the road, rats had burrowed a maze of tunnels beneath, rainwater had collected in patches, and the place was an unholy stinking mess of rotting food. To make matters worse, the sewerage system in Church Street is perennially clogged, and the hardworking guys who you call for emergency unclogging do their job (unclog the lines) and then throw the raw sewage on the road (clearing this is not their job). Disgusting, but true. If the sewage pipe is unclogged at 12 noon, the sewage lies on the road til the next morning, when BBMP (yes, Amir and his team), are ‘supposed’ to clear it- with their bare hands. It is fairly common to see piles of sewage lying in the middle of Church Street, within sniffing distance of the several restaurants! Within a few hours, this raw sewage dissipates on the road, is trampled upon by unsuspecting pedestrians, is scooped by car tyres, and soon blends into the streetscape. The stench can carry for over 50 feet down-wind – not great on a street that prides itself as the Food street of the city with loads of eateries. This is a great environment for wildlife, particularly rats, to breed, who feed on the garbage, gnaw on the electrical wires and eventually cause a short-circuit and minor explosion and black-out. Very often, electricity black-outs are solved by removing the charred carcass of a rat from the wires. If all this sounds disgusting and repulsive, don’t forget that all this is happening on a major footpath in Bangalore’s city centre, which well, no longer exists now as it has been dissected and destroyed. This gruesome feral scene, which could provide high shock-value pictures to any photojournalist covering the dark side of India’s urban growth, is being played out in full view of everyone on a main road – but nobody is watching. They are busy walking by and looking away; pedestrians are forced to walk on the narrow road, side-stepping the mess. The final result is that what is a narrow road to begin with is now choked with vehicles, pedestrians, and sundry dogs trying to get at the garbage. Hungry stray dogs that survive on open garbage cause several other issues – including sometimes attacking small children who pass by. One of Bangalore’s city commissioners lost his job after a spate of dog-bite cases involving small children. One problem leads to another – the cascading effect is a force multiplier. And nobody knows whom to blame – as it is convenient for agencies to point fingers at each other. And when you start trying to find out who is really responsible and accountable, where does the buck actually stop, you get no answers. Needless to say, focus is often placed on the symptoms rather than the underlying root causes. Our two crazies see it differently though. They feel that these problems can be solved by removing the root cause – eliminating open garbage dumping – and causing a reverse cascade away from ugliness. They believe nobody has approached the problem in this fashion – or if they have, it is not apparent. BMTC invites innovative posters and slogans for Bus Day publicity. The winner get a cash prize of Rs 15,000 for the best poster design. 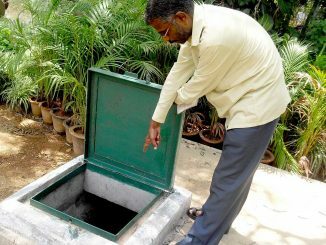 The city council allocated crores of rupees last year for rainwater harvesting at parks, playgrounds and BBMP buildings. What happened?